It is disgusting that Amaechi could insult Nigerians striving for his own political gains and those of the former military leaders turned politicians, calling for the stoning of his opponents forgetting that his own godfathers will be the first recepients of stones as prescription for the country's ailment. Any curious follower of events in Nigeria should have seen by now that Goodluck Jonathan's silence and the fear of what he is capable of turning into in the face of refusal to dance to the tune of former military leaders may have driven the king makers in the Peoples Democratic Party to a quick jumping off the boat. It should be clear to discerning souls that the trouble by some of the PDP governors and their defection was not a solo decision. They have the king makers behind them. They have visited Ibrahim Babangida; they have visited Abubakar Abdulsalam and they have also visiting Olusegun Obasanjo. All these have happened after their errand governors and a sizeable number of their supporters in the House of Representative’s defection to the APC. The next thing will be the defection of the king makers themselves. At least, the former vice-president, Atiku Abubakar had told the visiting APC chieftains that he would discuss with his supporters for a final decision of what to do about their membership of the ruling party. By the time the migration of the king makers and their errand governors is completed, the nation will know the ordinary people - though may have been infected by the get rich quick mania in the country - who are remaining in the PDP. We will remember that it is the king makers and their manipulative tendencies to win election at all cost and questionable past that have given the PDP a bad name and image from the beginning. By the time their migration is completed, what we may have thought as a great loss to the PDP may actually be a blessing in disguise, as an opportunity for the party to be born again devoid of membership of king makers Nigerians distrust. It will be disingenuous for a man like Muhammad Buhari to suddenly become same bedfellow with the former kingmakers in the PDP. If he says he is cooperating with them for the sake of moving Nigeria forward, the question to ask him is whether these king makers have ever move Nigeria forward, and that instead have they not been filling their own purses while Nigeria bleeds? Where did Ibrahim Babngida got his enormous wealth? Where did Olusegun Obasanjo got his enormous wealth? Is it not the same questionable wealth they are using to manipulate political engineering of poor Nigerians? Would enlightened Nigerians especially in the South West now found Babangida as same political bedfellow? Aside from the strange bedfellows the king makers and Bola Tinubu crowd will be in the opposition party, there is a need to address the issue of accountability, which Rotimi Amaechi has been hammering as if he and the king makers to whom he has become an errand boy are the holiest among the politicians in the world. Two Saturdays ago, it was in the news that Amaechi asked Nigerians why they have not stoned the politicians despite their excesses that he has been exposing. Amaechi may have forgotten about the nation’s history. No one will defend Jonathan or any of his ministers because they may not be what Nigerians bargain for. But if stoning has to be done against politicians who are corrupt, would it not begin with the king makers who have made our lives miserable while they take care of their own bank accounts? 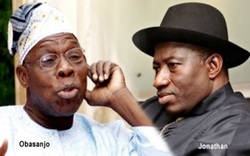 We will begin the stoning from Babangida and Obasanjo before it will get to Jonathan and his ministers.